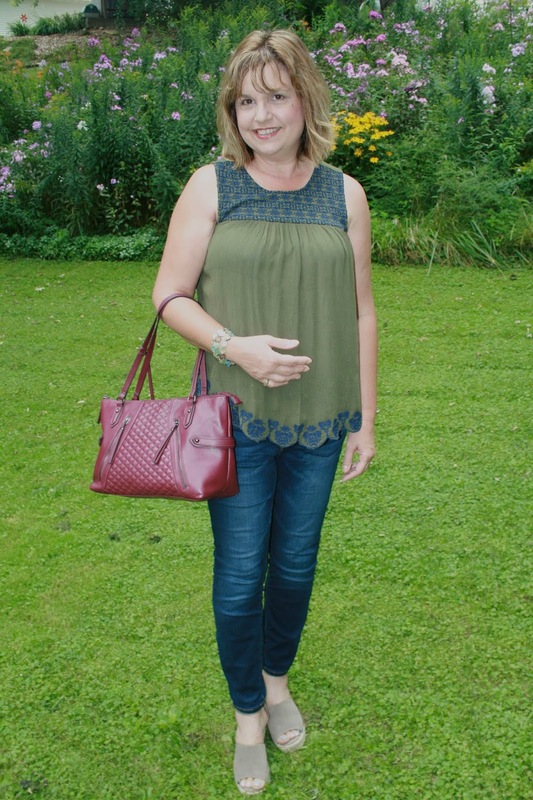 Back in May I shared this Olive and Blue top in THIS POST and said because of the color, I could see it working well in the fall too as a layering piece. Well little did I know then that we would be experiencing cool and chilly weather in August! Now, in late September, we are finally getting hot August temperatures in Wisconsin, go figure. But on the day these pictures were taken, August 13, it was cool and rainy so I styled my top with a utility jacket and jeans. 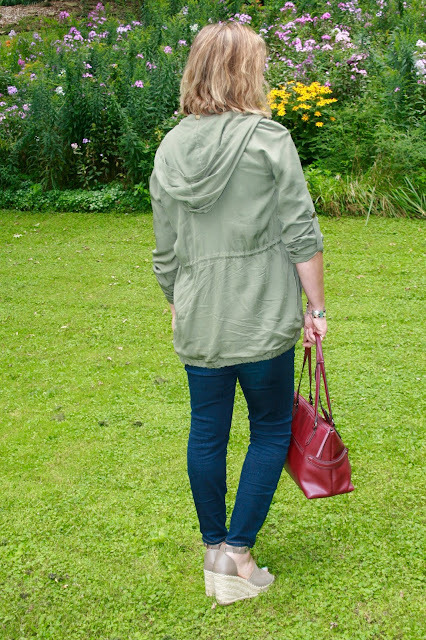 The utility jacket is from Stitch Fix (old). Even though it's not rain proof, it's one of my favorite pieces to wear on rainy days because of the hood. I wouldn't wear it in pouring rain, but it works very well for drizzly, overcast days. I love the drawstring waist and hem, to tighten up the jacket. I also like the option of having a shorter sleeve length because of the tabs. Shoes are by Steve Madden. For jewelry I just wore a bracelet. I carried a burgundy bag that I picked up last year from JCPenney. I'm happy to see burgundy is still trending this fall. I love how this color goes with anything! The top comes in three different colors and is still available HERE. So right, the top is going to be so pretty for autumn use too. And how your hair has lightened beautifully with all your summer gardening. Hugs, x. Thank you! As for the hair, although I'm sure the summer sun lightened it a bit, I do have professional highlights put in too! Love this look, yes the top is perfect for warm/hot fall days (it's in the 90's here this week!!) and the burgundy purse is definitely a perfect color for fall. Thanks Elli! It is so hot here too! So much for fall fashion! I have a similar utility jacket from Nordstrom, but it doesn't have a hood. Altho, my utility vest DOES have a hood! Lol! I wish it was the opposite. These colors work so well together and oh do I love those wedges you have on! Love the color combo and those are such cute wedges too! Well it's such a great layering piece! I love the color combo! 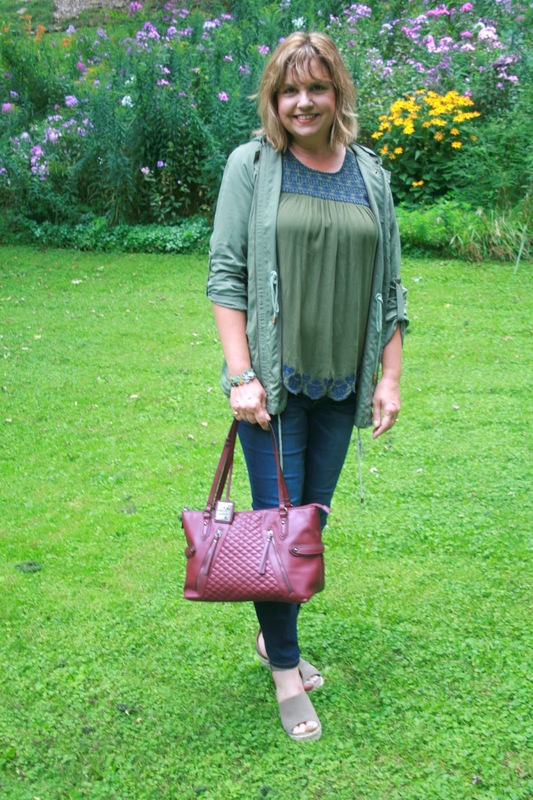 Denim and olive make such a perfect combination and your top is great for the warmer Fall temps some areas experience. 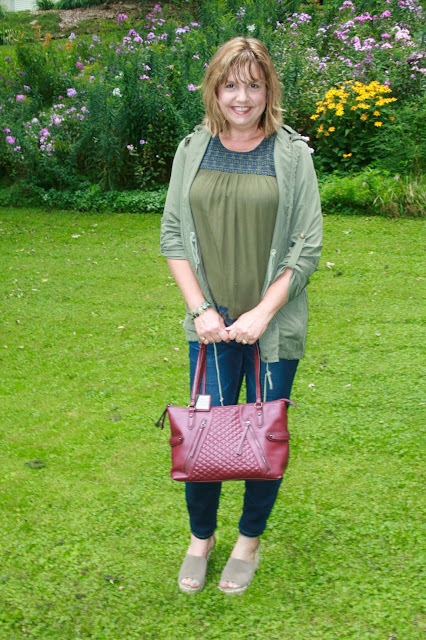 Thanks for sharing your styling ideas with my Fine-Whatever link up. Lovely olive colors, and those wedges are fantastic! I haven't done Stitch Fix in years but I'm planning to try it again soon. I hope I get something as cute as your jacket! Thanks Whitney. I actually stopped Stitch Fix because I didn't feel what I was getting was worth the money they were asking for it. But I did get a few things from Stitch Fix that were worth it, and this jacket was one of them. Thanks for linking up to Top of the World Style. Great color combinations! You look great in this look! I need to add some olive to my life. Great look girl. Thanks for linking-up with us. Ahh...I cannot wait for an excuse to wear my utility jacket! It's one of my fave fall additions for sure!